Portrait Painting of Mary Tunaley (b. 1775) by Joseph Wright of Derby. A portrait painting of Mary Tunaley by Joseph Wright of Derby is held by the Boston Museum of Fine Arts, Massachusetts. In April/May 2014, following relevant project information having been forwarded to Boston, the painting previously entitled "Mrs.Francis Boott" was retitled "Miss Mary Tunaley" with fresh provenance (click here). Mary Tunaley also features in the provenance for the Joseph Wright painting "Portrait of Sarah and Ann Haden" held by the Worcester Art Museum, Worcester, Massachusetts. For further details click here. Many thanks to all contributors (click here) for their help with this project. Special thanks to Dr.Jane Holmes of Auckland. Along with providing valuable help and encouragement, Jane has located and submitted significant breakthrough source information particularly with regard to the early Tunaleys. Peter Perez Burdett's 1769 sketch of Full Street, Derby, where the original Thomas Tunaley lived. THE TUNALEYS' ITALIAN ANCESTOR, THOMAS "TUNALLI"
"THOMAS TUNALLI - MERCHANT of MILAN"
Mary Tunaley's connections with her illustrious neighbours of Full Street and Queen Street: Joseph Wright and Erasmus Darwin. The Boott Mills, connection to William Strutt, the Will of Kirk Boott Snr. Thomas Tunaley Snr. and The Start of Dyeing on "The Holmes"
George Sorocold of Derby - "The First British Civil Engineer"
Thomas S. Tunaley meets Ralph Waldo Emerson, American author, poet and philosopher. Sarah Tuna;ey (b. 1837) - Marriage and the Tunaley move to the Railway. Catharine Tunaley (b 1768) and the actor husband who switched his name. William Simpson Tunaley, Mayor of Preston, Melbourne, 1959/60. The Tunaley Family of U.S.A.
Engineering Exploits of George Threlfall (M.I.C.E., M.I.M.E.) Civil and Mining Engineer. Martyn Threlfall (O.B.E) 1932 -: Private Secretary to J.Lyons, Australian Prime Minister. Above:Richard Arkwright's Masson Mill built Cromford, Derbyshire, 1783. Click here or on image to enlarge. 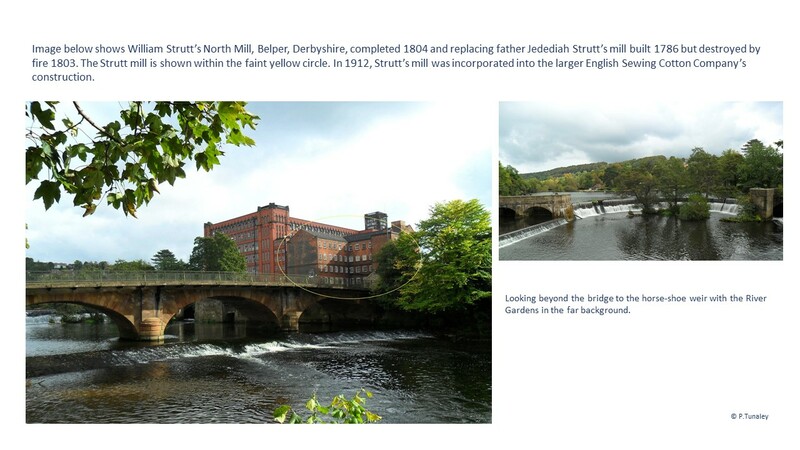 Below: Strutt's mill of 1804 replacing father Jedediah's mill of 1786. Click here or on image to enlarge. Below: Remnants of the Old Derby Silk Mill (building completed 1722). Click here or on the image to enlarge. Click on picture to enlarge and for further information. 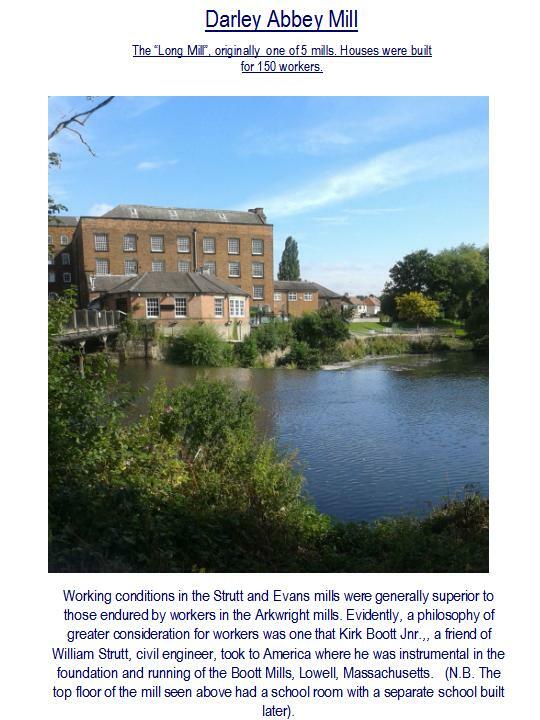 Darley Abbey Mill, one of the Derwent Valley mills built ca. 1783 onwards ostensibly by landowner Thomas Evans and his sons. The Strutt and Evans families were closely connected by two marriages with Jedediah Strutt formerly a partner of Richard Arkwright. 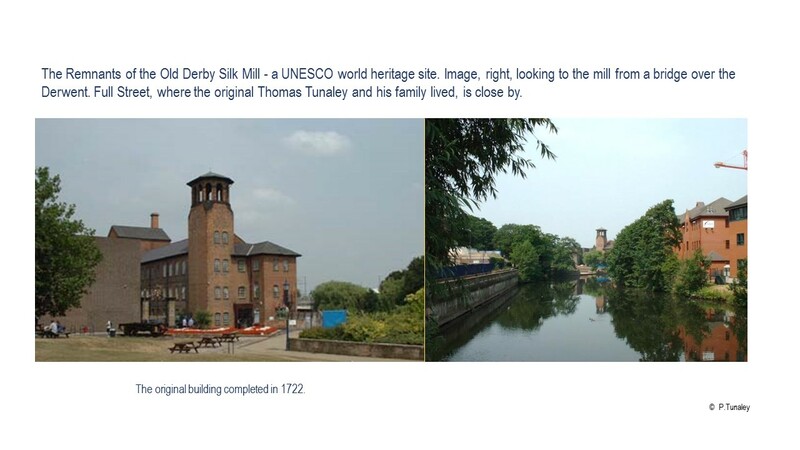 Building started at around the same time as Strutt's second mill at Milford and Arkwright's Masson Mill at Matlock Bath (1783) so it's likely the Strutts were also much involved in the building of the Darley Abbey mills (see "The Original Tunaleys and a Timeline"). This mill, one of five, specialised in producing quality thread for sewing, embroidery and haberdashery. 150 houses were built for the workers.